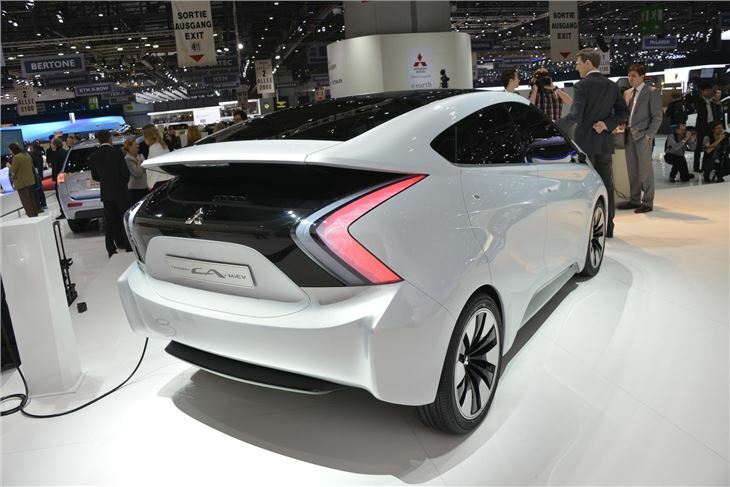 The new Concept CA-MiEV will showcase Mitsubishi's Electric Vehicle technology, as well as hint at future production vehicles, even though the company claims it is 'not for production'. 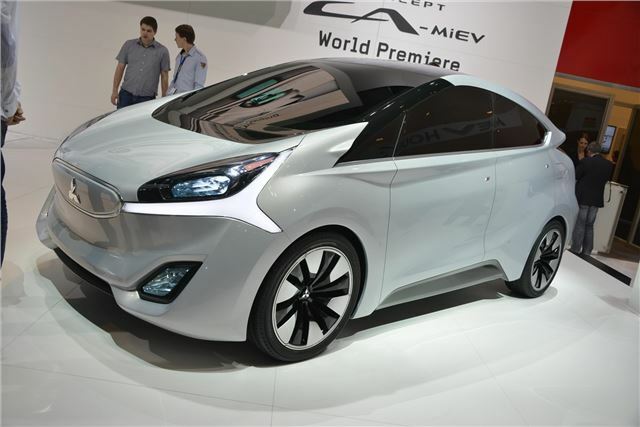 The CA-MiEV is Mitsubishi's first concept car in years, and is a small hatchback that will be supported by three years of i-MiEV global customer feedback since 2009. The Nissan Leaf-rivalling hatchback will show how much battery vehicle technology has moved on since the launch of the pint-sized i-MiEV. 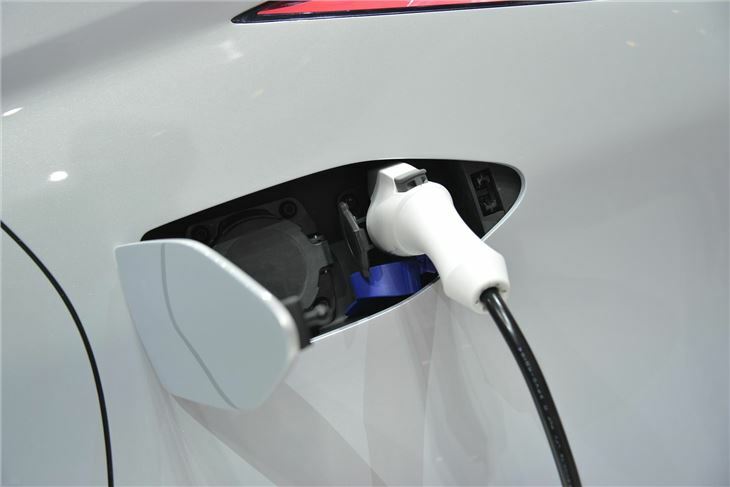 It's powered by a 'high density' battery system, which is both lighter and more efficient than the current system - and when allied with the CA-MiEV's aerodynamic body (Cd is 0.26 - an outstanding figure for such a short car) is said to deliver a 190-mile range on a single charge. Further innovative real-life features include magnetic resonance wireless charging technology and smartphone activated functions. The Concept CA-MiEV is packed with drag reducing details such as, full flat undertray, rear-view cameras (to replace mirrors), minimal air intakes, rear diffuser, Concept CA-MiEV is also full of dramatic detailing – from the boomerang-sculptured front and rear lights to the ascending side character line enclosing the rear wheel arches to create a strong forward motion effect. Equipment list is also pretty full, as you'd expect from a concept car. But there are some interesting innovations, which we hope will reach production sooner rather than later, such as automatic e-mailing in case of theft, automatic e-calling in case of an emergency, remote controlling (engine start/no start, panic alarm, door locking, and data transfer (maps) from Smartphone to in-car system. All-in-One integrated power unit (80 kW motor + inverter + charger) - to help with energy management, packaging and weight reduction. Compact flat battery pack – to help with packaging (especially for possible later applications like range extender) and better long term battery performance. High density energy Lithium-ion batteries – to help with energy efficiency and also with packaging. I'm really looking forward to hearing about when this car will be built and sold and how much it will cost, etc. Even if the real world range is "only" ~120 miles, it will be a winner!